Marius Kluge Foss and Gina Nygard, Rystad Energy, review the state of the upstream industry on the Norwegian Continental Shelf and propose a way to electrify the Barents Sea, the new Norwegian petroleum province. From peak production of close to 4.6 million boe/d in 2004, the Norwegian continental shelf (NCS) saw falling production levels down to 3.7 million boe/d in 2013. From 2014, production started to increase again, following years of high activity with the sanctioning of new projects and redevelopment of mature producing fields. Figure 1. Total NCS production split by province, million boe/d. Source: Rystad Energy UCube. Of the three main provinces on the NCS, the North Sea has historically been the dominant one. Driven by the giant Johan Sverdrup field with start-up scheduled for late 2019, production levels are expected to remain rather flat towards mid-2020s, before the final decline phase. Similarly, the start-up of Aasta Hansteen in the Norwegian Sea is expected to increase output in the short term, while the province is set to decline in the long term. That leaves the Barents Sea, which is the only Norwegian province with anticipated future growth. Currently accounting for a mere 5% of total Norwegian production, Rystad Energy estimates that the Barents will comprise around one third of the total production by mid-2030s. The first growth cycle is expected at the start of the next decade. With the anticipated start-up of new discoveries, total Barents production may reach 500 000 boe/d in the 2020s. Figure 2. Barents Sea oilfield service purchases, US$ billion. Source: Rystad Energy DCube. New sanctioning activity is required to achieve this growth, and several of the largest non-sanctioned fields in Norway are located in the Barents Sea. The single largest project is the Statoil operated discovery, Johan Castberg. The discovery is planned to be produced with an FPSO and could get final approval as early as next year. Statoil and its partners have worked on reducing the costs for this project; reporting that the breakeven oil price has dropped from US$80/bbl to around US$35/bbl through this process. The two other key discoveries in the Barents Sea are Wisting and Alta/Gohta, and together with Castberg, these projects will transform the Barents Sea into an oil-producing province. To increase the resource base for these projects and improve the commercial terms, several new prospects will be drilled in the area within the next two years. The future resource potential in the Barents Sea is considered to be significant, and around 60% of currently undiscovered resources on the NCS are expected to be discovered here. Investments in the Barents Sea increased amid the high oil price environment during 2010 - 2014, mainly driven by the development of the first stand-alone production platform, Goliat, and high exploration activity. Following the oil price collapse in 2014, E&P spending has come down significantly and is currently only one third of what it was in 2014. The expected increase in activity in the Barents Sea requires a new investment cycle, and annual spend is expected to grow by an average of 33% per year between 2017 and 2025, reaching more than US$8 billion in 2025. Johan Castberg, Wisting and Alta/Gohta will likely be developed with FPSOs and extensive subsea scope, constituting a large share of the costs. In addition, costs associated with drilling operations will increase in line with more fields being put on stream and increased exploration activity. Figure 3. CO2 emissions from NCS upstream production by field status (million tonnes CO2). Excludes emissions from drilling rigs. Source: Rystad Energy research and analysis. The long investment and production horizons of the projects described above make the consideration of carbon risk a highly relevant part of the equation. These fields will produce beyond the 2040s, in a period that might be associated with declining global oil demand and stricter CO2 regulations. Making decisions today that minimise this risk could therefore be worthwhile. CO2 emissions from a producing oilfield are more or less constant throughout its lifetime, regardless of production level, making field shutdown an important parameter when gauging long-term emissions from the Norwegian upstream industry. Currently, producing fields are important for future developments as they often serve as tie-back hosts, thereby lowering new development costs and limiting direct emissions from new fields. Figure 3 outlines historical and forecasted CO2 emissions associated with oil and gas production on the NCS towards 2050. Rystad Energy predicts a reduction in upstream CO2 emissions of around 60%, from 10.6 million t in 2015 to 4.5 million t in 2050, where sanctioned projects with electricity from shore are taken into account. The largest share of CO2 emissions comes from fields that are currently producing, and the emissions from these fields are expected to account for more than 80% of total CO2 emissions during the 2017 - 2030 period. Looking further ahead at accumulated emissions over the 2040 - 2050 period, Rystad Energy stipulates that the three Barents Sea discoveries closest to sanctioning – Johan Castberg, Wisting and Alta/Gohta – make up approximately 8% of the total NCS emissions. Adding future volumes, expected to be discovered and put into production in the Barents Sea by 2040, increases the cut potential of electrifying the Barents Sea to 25% of expected NCS upstream emissions during 2040 - 2050. Figure 4. Barentshub – overview of concept and stakeholders. Electrification of fields in the Barents Sea is challenging for several reasons, but primarily due to the vast distances. Rystad Energy addresses this issue in the following with a suggested electrification solution, either full or partial, for the three ongoing Barents Sea developments, Johan Castberg, Wisting and Alta/Gohta, as well as potential future discoveries. The proposed solution envisages a separate host platform, a Barentshub, with onboard HVDC converters, supplied with DC power from shore. The hub will distribute AC power to the three surrounding platforms, none of which will be further than 100 km away, a distance viewed as the upper bound for subsea AC cables. Other solutions have been proposed, but were found to be unfeasible, such as AC from shore and Statoil’s proposed single field HVDC-platform next to Johan Castberg. The main drivers of the E&P companies’ power demand are electric power, heating, and gas injection. These can either all be served by electrical power from shore – referred to as ‘full electrification’ – or by a ‘partial electrification’ solution, where a gas turbine with heat recovery unit covers power demand for gas injection and a significant proportion of heating needs, while the remaining power is covered by electrification from shore. Full electrification is estimated to generate an annual average power load from the three fields of 298 MW per year at peak, while a partial electrification is estimated to draw 78 MW at peak. The corresponding reductions in CO2 emissions throughout the three fields’ lifetimes is estimated to be 22 million t and 8 million t for full and partial electrification, respectively. 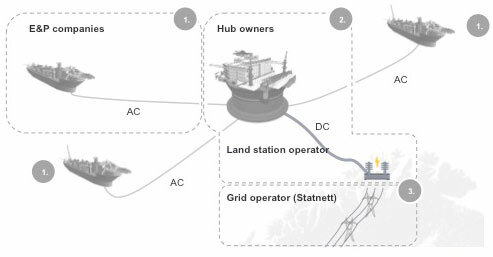 Figure 4 illustrates the various stakeholders in such a setup, consisting of 1) the E&P companies owning and operating the facilities at the three fields, 2) the hub owner, which is likely also the land station operator, and 3) the grid operator, which in this case is Statnett. Each stakeholder has its own set of considerations in the proposed hub electrification configuration. The E&P companies will naturally be most concerned about operational performance and project economics, while the hub owner group’s key priorities will be power demand predictability and hence revenue. E&P companies: operational performance, power tariffs/cost, impact on project scope, CO2 taxes and the EU Emission Trading System (EU ETS). Hub owner: power demand and high utilisation, electricity prices and tariff mechanism. Grid operator (Statnett): grid capacity, power supply, local considerations, concessions and lead time, project priorities. The Johan Castberg field development project has been through concept selection with gas turbines selected as the primary source of power and heating, whereas both Wisting and Alta/Gohta are scheduled for DG1 in 2017, i.e. approval to start concept planning. Concept studies will follow during 2017 and into 2018, representing key timing for Barentshub. 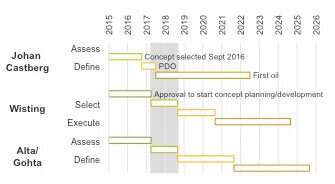 With current resource estimates and oil market outlook, Rystad Energy expects all three projects to, more or less, follow the operator’s communicated timelines, but with Alta/Gohta delayed to 2026. The plan for Johan Castberg is to use gas turbines for power, but also to be enabled for future electrification if an economical and technically viable solution becomes available. Wisting and Alta/Gohta are still at the pre-FEED stage, and the progress and final concept selection have significant bearing on Barentshub. Figure 5. Current timeline for the three largest Barents Sea discoveries. Source: Rystad Energy research and analysis. Another key component of electrification in the Barents Sea is the surrounding power grid capacity and power supply. Statnett, the operator of the Norwegian power grid, recently made a final investment decision to upgrade crucial parts of the infrastructure in Finnmark, Northern Norway. With only minor additional upgrades, this infrastructure can deliver 250 MW to the upstream industry in Hammerfest. The lead-time is estimated to be ~five years and will be in time for all the three ongoing offshore developments. However, this would not be sufficient to support full electrification of all three fields. Rystad Energy estimates full electrification of the three fields to require ~400 MW of intraday peak capacity, with annual average load just below 300 MW. This will render the new line insufficient with its 250 MW capacity, but it will still be sufficient to cover Johan Castberg until 2025, before Wisting will potentially hook into the system. Statnett has further evaluated new transmission lines, either from Southern Norway or through Finland. Both concepts are likely to have lead-times of about eight years. This would provide sufficient capacity for a full electrification of all fields – just in time for Wisting field startup in 2025. 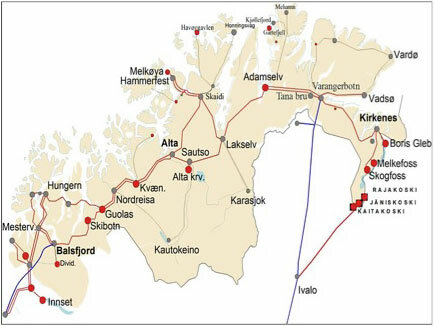 The Barentshub, including the power station on land, is estimated to require an initial investment of just below NOK 9 billion, with power cables from Hammerfest to the hub and onwards to the three facilities making up close to 50% of the cost. The estimates are based on empirical data and industry quotes for relevant components, such as HVDC equipment cost from ABB and a floating, cylindrical host platform from Sevan Marine. Operators on the NCS are subject to two policy instruments aimed at reducing CO2 emissions, the EU Emission Trading System (EU ETS) and the Norwegian carbon tax. The assumptions with regard to the development of these are also a crucial part when considering the optional value of substituting gas-fired turbines with electrification. With current ETS prices around €5/t CO2, the EU acknowledges that the price must be increased to give the right price incentives to emitters. The Norwegian carbon tax, introduced in 1991 at a price of NOK 350/t CO2 (~€40/t), has since grown to its current level of NOK 436/t. The combined CO2 cost for E&P companies on the NCS, currently at €53/t, is expected to increase to more than €70/t by 2040 as regulatory frameworks tighten in Europe. Figure 6. Electrification impact on asset valuation (delta versus gas turbines) BNOK, NPV per 01.01.2017. The estimates are based on Rystad Energy’s proprietary upstream database, UCube. Future Nordic power prices are likely to see an incline towards 2030, reaching NOK 300 - 380/MWh (real 2017) from the current 200. This increase is largely caused by the combination of expected shutdowns of nuclear plants in Sweden, Germany and France, along with increased export capacity from the Nordic countries through new cross-border interconnections and improved transmission capacity. Figure 6 outlines the combined effect on asset valuation for Johan Castberg, Wisting and Alta/Gohta by switching from gas turbine power generation to 1) partial electrification with one turbine for gas injection and 2) full electrification. The start-up years in all cases are 2023, 2025 and 2026 respectively. For the oil companies, the only negative value contribution is power Opex, with Capex savings, Opex savings (excluding power), reduced CO2 tax, and government take all contributing in the positive direction. The combined value for the three fields drops by 3% from NOK 18.6 billion in the gas turbine case to NOK 18.0 billion with partial electrification. It decreases to NOK 17.3 billion (-7% compared with gas turbines) when assuming full electrification. The power price that the E&P companies will have to pay in this example is calculated as the forecasted spot price multiplied by a price mark-up that is such that the Barentshub will yield an average return of 5% annually. This highlights the limited impairment that electrification actually has on these fields. Albeit expensive, the full impact of electrification on valuation is just a 7% reduction compared to no electrification, and the future potential of carbon risk, both in terms of global carbon budgets and carbon taxes, is substantially reduced. In fact, electrification is often the optimal economical solution for other fields in both Norway and elsewhere. For example, electrification is the preferred solution for many developments in the Middle East, where offshore power demand has been so high that it has made economic sense to centralise power generation at large power plants onshore, with power distributed to the offshore facilities via a complex power distribution system. From a socio-economic perspective, the Barentshub case is sub-optimal since it reduces NPV for society compared to the gas turbine case. However, if the Norwegian government wishes to deliver on its ambitious emission cuts and be a frontrunner in the global climate discussion, several costly cuts must be made domestically. The cost of the last marginal abatement measure will set the cut-off for the cost-efficiency of potential projects, which will be potentially more costly than electrification of the Barents Sea.